The future of the WTO is at stake. Could this year's G20 trade meeting hold the key? This week, trade and investment ministers from the G20 will gather at Mar del Plata in Argentina for the first time since the tariff dispute started in the spring of 2018. The timing could not be more challenging for this group of developed and emerging economies to meet, especially with various G20 members involved in a continued escalation of tariffs on billions of dollars of imports. Moreover, a fortnight before this meeting, President Trump told Bloomberg that if these nations “don’t shape up” he would withdraw from the World Trade Organization (WTO). Against this backdrop, it is crucial for G20 ministers to act on three issues to save the WTO - and, by extension, the global economy. 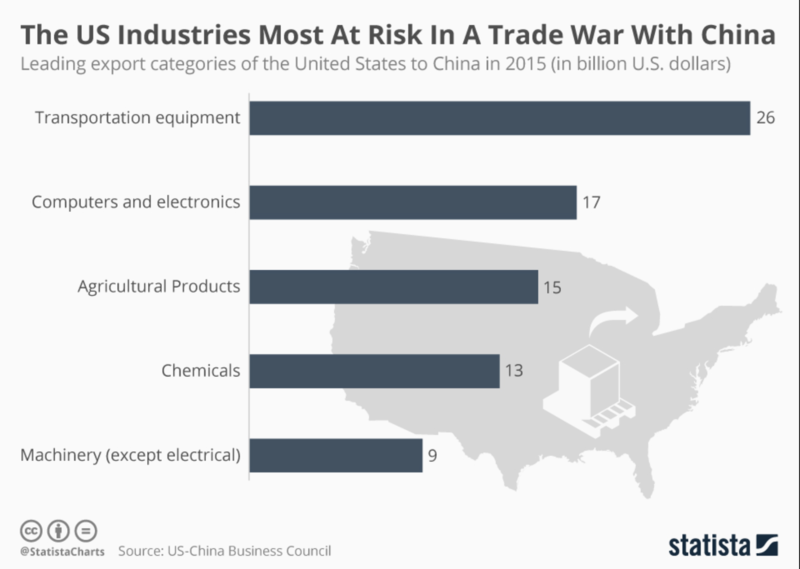 US industries most at risk from a trade war with China. The first priority for the G20’s trade ministers must be to continue to engage the US and to agree on conducting trade relations based on multilateral rules, not by unilateral actions and harassment. The rules of non-discrimination, transparency, fair competition and an independent dispute settlement system have become a fundamental part of the soft infrastructure of global business, and have benefited everyone - including the US. The US’ withdrawal from the WTO would be an act of immense self-harm. Without WTO membership, US exports would no longer enjoy most-favoured nation tariffs from over 100 trading partners with which the US does not have a free trade agreement (FTAs). The US only has 14 FTAs, and none with the world’s largest traders such as the EU, Japan and China. If the US were to pull out of the WTO it would create a commotion, but either this or the next US administration would unquestioningly return to the fold via WTO accession negotiations. The Trump administration’s retreat from the Trans-Pacific Partnership (TPP) only to reconsider joining it a few months later has set a precedent here. Fear of the US’ departure has already turned the WTO into a hostage of the Trump Administration, which has for example blocked the filling of vacancies on the WTO’s Appellate Body - one of the “systemic challenges” described by WTO chief Roberto Azevedo. But the other G20 members should not bend to the US’ threat to leave. Instead, the G20 trade ministers should get the US to agree on two matters. Firstly, that trade disagreements should be solved within the WTO’s rule-based dispute settlement framework, not with unilateral action and harassment. Secondly, a deadline should be established to solve the Appellate Body crisis - say, by 31 December 2018 - and WTO members should take an emergency vote if and when that date is passed. While it is debatable whether China is the source of the problem that has triggered aggressive trade measures from Washington, the middle kingdom does need to take more responsibility and should aim to be part of the solution. China’s GDP has grown from $1.3 trillion to $12 trillion since its accession to the WTO, and as such it is among the members who have benefited immensely from the WTO’s predictable trading terms. The G20 provides an opportunity for China to walk the talk to “make economic globalization more open, inclusive, balanced and beneficial to all”, as stated by President Xi Jinping in April. First of all, trade ministers should urge China to refrain from escalating trade tensions by using further restrictive measures on trade and investment against the US. The uncontrolled consequences of these actions damage firms from third countries involved in global production and distribution chains. The WTO dispute settlement system remains the best platform available for resolving trade conflicts. China should also respond constructively to issues raised by other G20 members, notably those in the trilateral joint statement made by the US, Japan and the EU in May that referred to state-owned enterprises (SOEs), industrial subsidies and coerced technology transfer. Other concerns centre on non-tariff barriers, transparency and notification obligations. Finally, China needs to take further liberalisation measures - in particular by joining the WTO’s government procurement agreement, which will open up digitally-enabled trade in services, and by committing to reciprocal treatment for foreign investors. It is time for the G20 to begin serious deliberations around developing a new strategic orientation for a modernised WTO. Calls for WTO reform have intensified in recent months, but they go back to the late 1990s. At that time many governments, NGOs and academics viewed the agreements made in the Uruguay Round of WTO talks a “bum deal” that was weighted against developing countries’ interests. In that context, the Doha Development Agenda was launched in 2001 to address the problems that the previous round had created for developing countries. “The WTO is a large complex and elaborate system, but it’s now indeed lagging behind the dramatically changing world,” said Ricardo Meléndez-Ortiz, co-founder of the International Centre for Trade and Sustainable Development. With the various “game changers” now buffeting the global economy, such as the rise of emerging economies, the proliferation of the digital economy, the upsurge of global value chains and the universally agreed United Nations’ (UN) 2030 Sustainable Development Goals, it is clear the WTO needs to adapt its rules accordingly. Where now for the World Trade Organization? Not too big, not too small, the G20 is just the right-sized group to consolidate an agenda for WTO modernization. First, such an agenda should balance the interests of developed and developing countries. For example on subsidies, the former pushes for greater discipline of the manufacturing sector, while the latter believes that a fairer approach to agriculture subsidies in, and better market access to, developed countries should be part of the discussion. In respect to state intervention in technology transfer, new rules should prohibit governments from forcing foreign technology owners to transfer technology to domestic entities in non-market conditions, but they should also prohibit governments from restricting firms from exporting their technologies in market conditions. Secondly, modernization should also reflect the needs of present and future generations. For example the WTO should clarify or update its rules on climate-related issues, such as eliminating fossil fuel subsidies, considering more policy spaces to scale up the use of clean energies, and facilitating the transfer of climate-friendly technologies. “If you do not change direction, you may end up where you are heading”, warned Lao Tzu. The 10th anniversary of the G20 could be a crossroads. It’s time to make a turn.